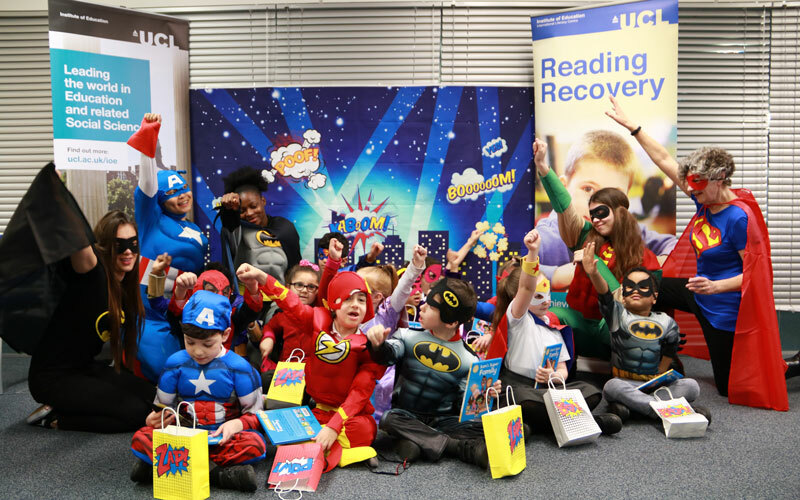 London schoolchildren have been discovering the power of reading in an event held at UCL Institute of Education (IOE). The children were visited by superheroes to signal the start of Read Aloud, a month which is designed to celebrate reading. As part of Read Aloud, schools, teachers and children are hosting events and activities throughout March. The activity is designed by the IOE’s Reading Recovery programme, a literacy programme designed for the lowest achieving children aged around six that enables them to reach age-expected levels within 20 weeks. The launch event saw children and IOE staff talking about their favourite books, how reading helps them write and how reading can give you superpowers. The children then read their favourite books to adults dressed as superheroes. Supporters of Reading Recovery include footballer Gareth Bale, actress Gillian Anderson and author Pie Corbett, among others. "Reading is an essential aspect of my professional life, but there is nothing better than relaxing whilst reading a gripping novel." "Reading to and with my children when they were younger were some of the most enjoyable times as a parent; Watership Down was a particular favourite in my household." "Reading gives me the gift of special time with my children." "Being able to read enables choices and opens up the world for us."